It is perhaps 6 or 7 years ago when I started making what I call Looking Boxes from my thousands of photographs, some of which go back to as early as 1962 in color slide form. And a bit later I started photographing the Looking Boxes and baking the resulting 2D images onto aluminum panels. Looking Panels, I call them. But this week, Places popped into my head (after all, our retail design store + gallery has the name we gave it back in 1978: Placewares. Wares for your place. So a natural addition to my series is Looking Places. This first piece, Looking Place #1, measures 11” x 8” x 8” and creates a virtual PLACE that one can imagine being in and at and around. 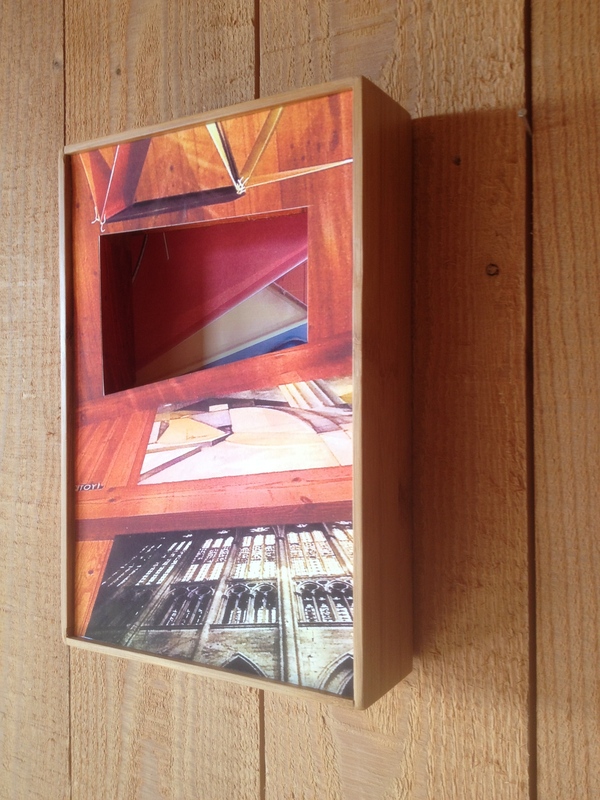 Prints of my photos applied to the various in-and-out planes, plus colored pencil grid drawings on the hinged-panel box, completes the assemblage. Images in this first of upcoming series of Looking Places are ones I’ve taken over the years of the northern California coast where we live and have our Placewares+LyndonDesign shop+gallery. Tomorrow Lu and I will be Stepping Out of the Box for two weeks to continue our search for new ideas and places and objects (in Paris and Berlin particularly). And soon after, it’s very likely that some images will appear in my new Looking Boxes. Stay tuned! My photo here in our living room invites my mind to develop it into a new Looking Box. That living room wall and ceiling have works (pictured) by favorite artists/designers: Charles and Ray Eames (the hanging paper “The Toy”, 1951, and a portion of its original box on the left in the photo). And a 1970s photo of Beauvais Cathedral by Alice Wingwall, and an oil painting (2006) by Jesse Wood. Below is my 9 x 6 Looking Box, inspired by these images—first shown in front of Alice’s Beauvais image and then hanging on a wall. This is the first Looking Box of our New Year!